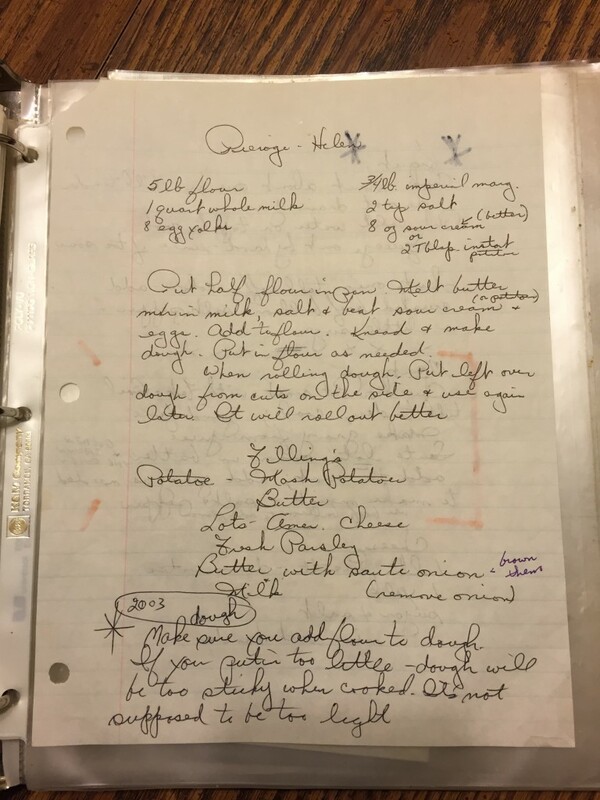 She sent me a text of her grandmother’s hand written recipe, straight out of her mother’s cookbook. This had been a tradition in her family for several generations. 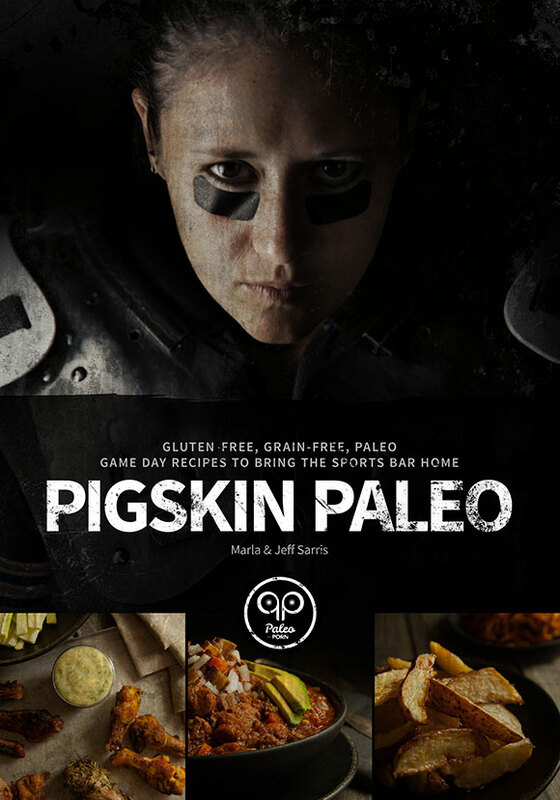 My goal was to make a gluten-free, nut-free and dairy-free, paleo pierogi recipe that Jess & her family would be able to enjoy. After I got her text I decided to do a little more research at the library and also online to learn how others traditionally make their pierogi. As you can see from the recipe above, there aren’t many ingredients that are necessary to make pierogi. Since Jess’ grandmother’s recipe used so much dairy including milk, margarine and sour cream, I wasn’t sure how on point my recipe was going to be when they were compared (taste wise). Also, since I’m not consuming any dairy, I was considering my options. Typically I’ll turn to coconut milk or unsweetened almond milk when I want a dairy replacement but after reading a bit about traditional pierogi recipes I decided to go simple and use the all-familiar, allergen-free liquid; water. To replace the wheat flour I considered using almond flour but Jess’ husband is allergic to nuts so I wanted to use a flour he would be able to eat as well. 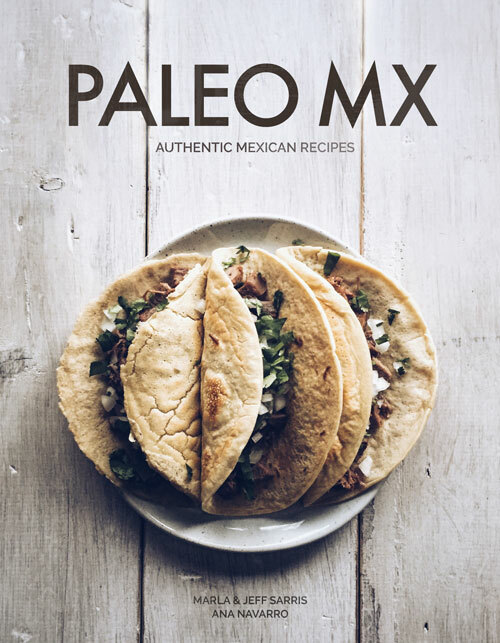 While working on Paleo MX we have been able to develop many of the authentic Mexican paleo recipes using nut-free cassava flour so I decided that was the flour I was going to experiment with. 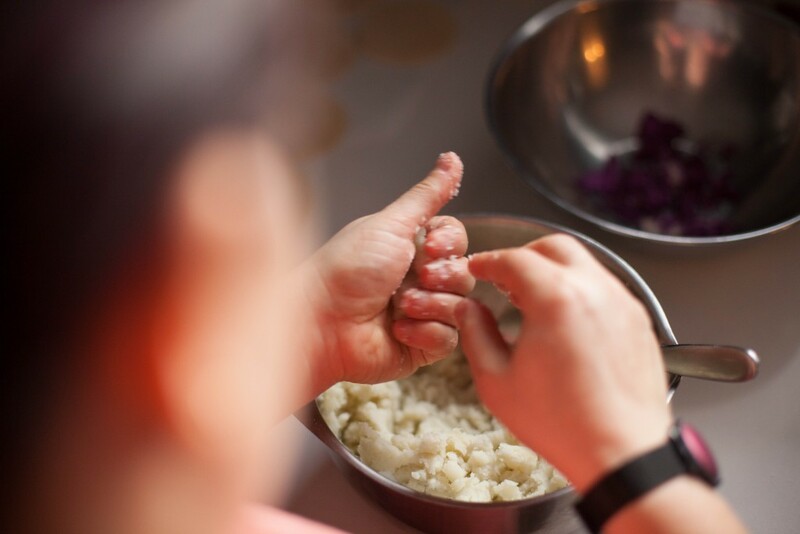 The last ingredient to discuss, when it comes to making the pierogi dough, are eggs. Her grandmas recipe was very egg yolk heavy though some other recipes I found would use the whole egg. Now a days if you’re having pierogi, or the Italian equivalent of ravioli, you’re probably buying a bag of a frozen, pre-made product in the freezer isle of the grocery store. I know that’s what our family was buying when we had ravioli every Sunday. But where’s the fun in that? Food should be enjoyed but also, food should not be a mystery. 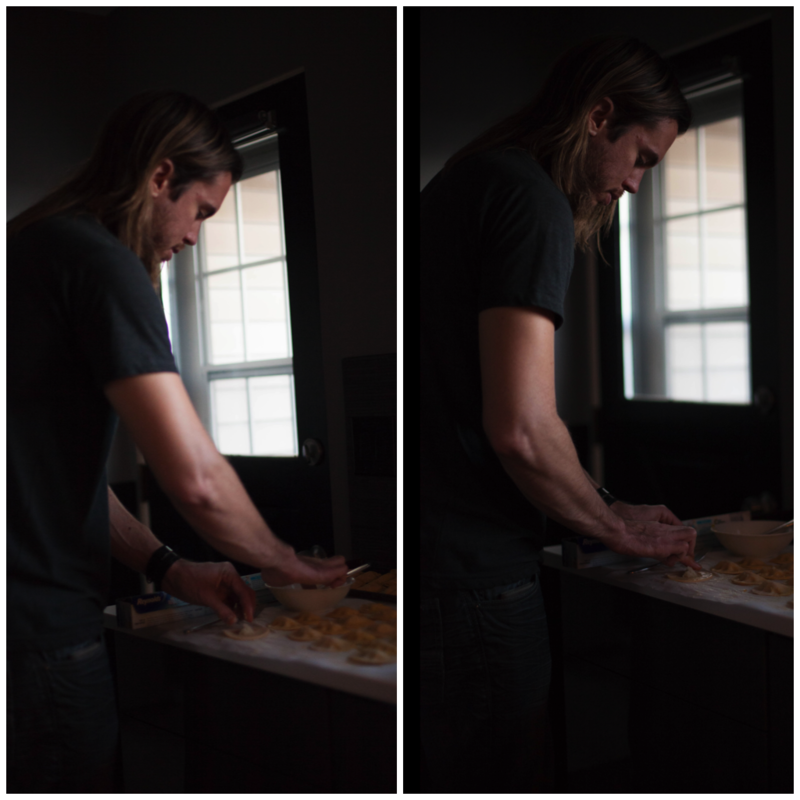 In order for people to appreciate the process, one must understand how food is made. Even though I had never tasted Jess’ grandma’s recipe I was confident I could make a great paleo pierogi. 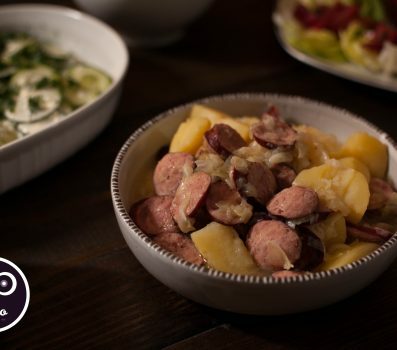 The most difficult part was that I had never had the original recipe and it had also been years since I had tried any pierogi in general however I was serving this as the main dish at my paleo Polish Christmas dinner so I knew our family & friends (who are not paleo) would tell me what they thought, good or bad. And everyone really loved them so I knew I could share the recipe. As it turns out, making homemade pierogi from scratch is really quite easy. 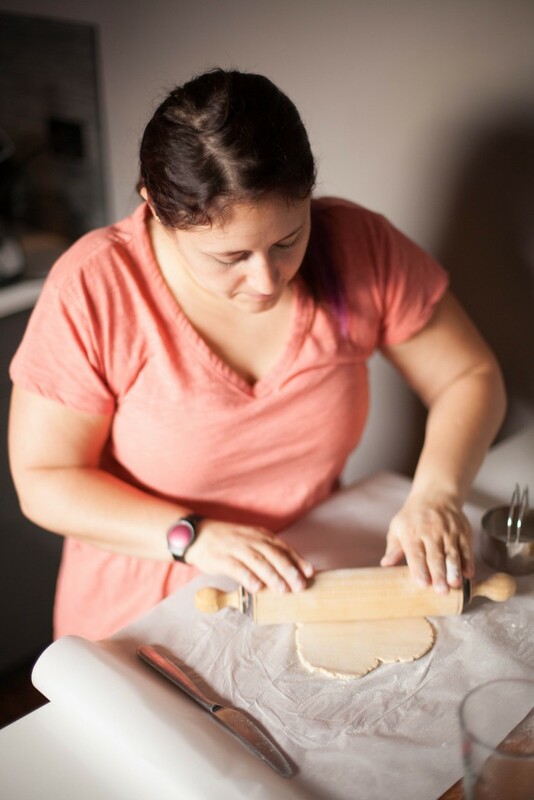 There may be several steps in the process but in the end, whether you’re making them yourself or you have an extra set of hands available to help, food just tastes better when it’s made from scratch. 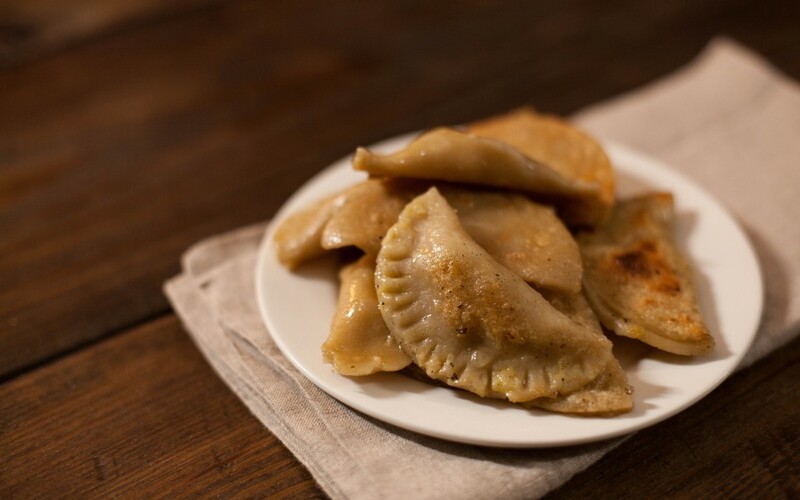 The first thing you must decide is whether you are making a sweet or a savory pierogi. With this recipe I made a savory pierogi filled with mashed potato, though the process is exactly the same no matter the filling. So when I say you have to decide whether you’re making a sweet or savory pierogi I’m simply helping you plan ahead. 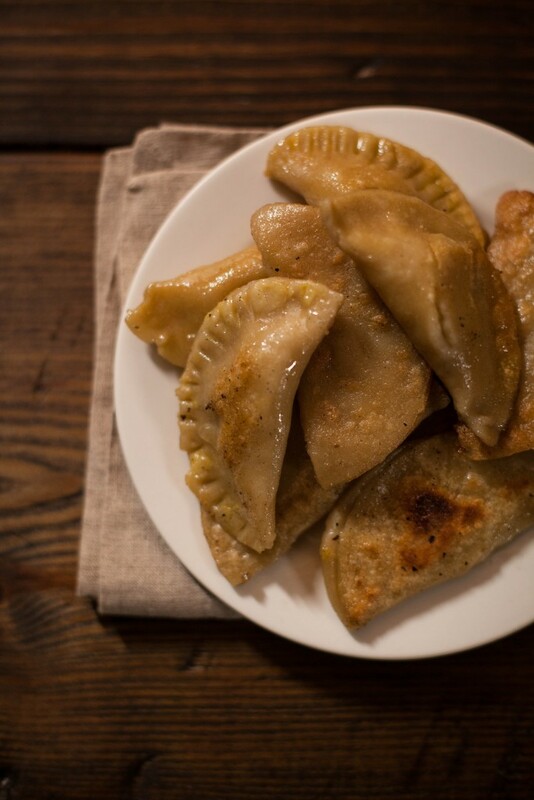 No matter what you decide to fill your pierogi with, you’ll want to make the filling first. If you choose not to stuff your pierogi with mashed potato, as I did, that’s completely fine. You’ll still understand what the process looks like by following this recipe. You will just need to decide on how you’d prefer to stuff your pierogi prior to getting to that point. Once you have your filling made you’ll want to start on the dough by following the recipe below. 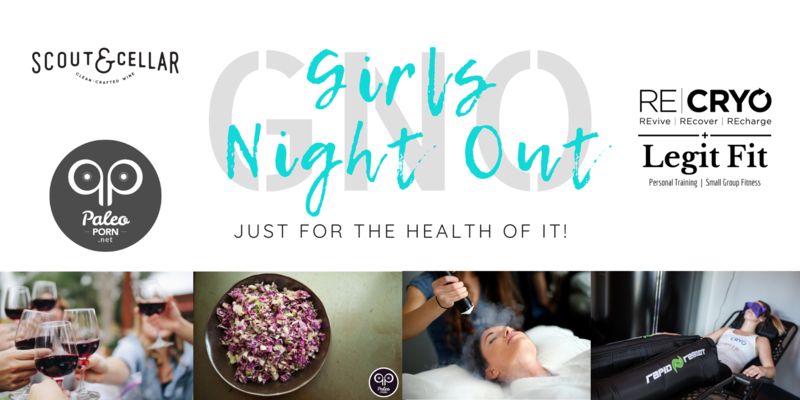 Especially if you want a nut-free and dairy-free recipe. 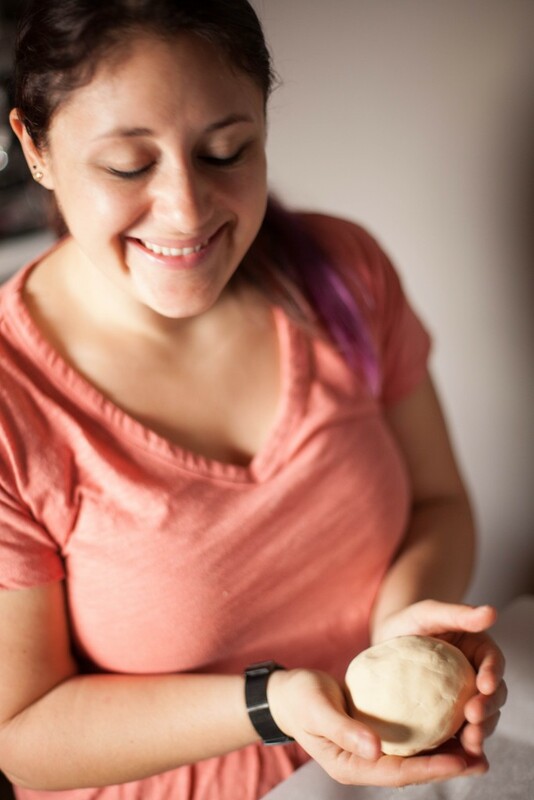 I placed a piece of parchment paper on my cutting board and sprinkled a light layer of cassava flour over that before rolling out each ball of dough. When the thickness was perfect I used a 3-inch biscuit cutter to form the circles for the pierogi dough. If you don’t have a biscuit cutter, no worries, you can also use a cup to cut circles into the dough so they’re 1 1/2 (6 cm) inch in diameter. The width of a sealed edge should be 1cm or less to give you an idea of what you’re going for. 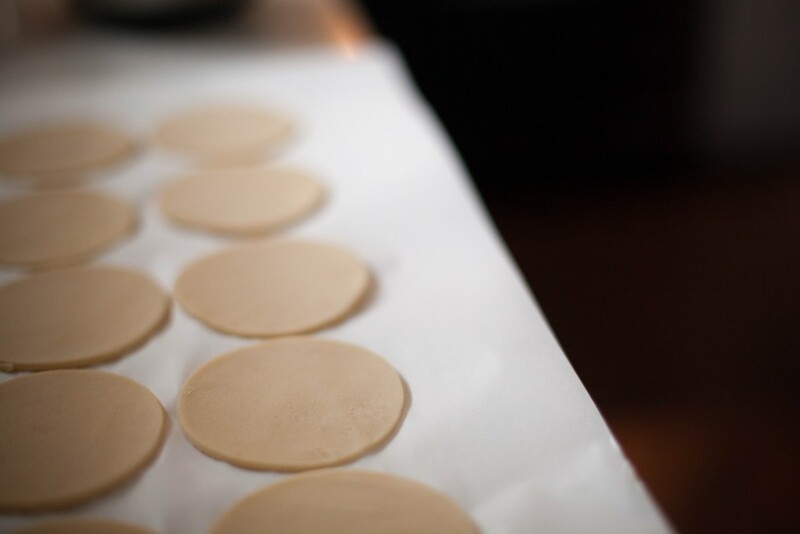 Once you’ve cut your first set of circles, you’ll want to lay out more parchment paper on your counter to create a resting zone so you can finish cutting all the dough at the same time. This will make transitions easier and at this point if you have extra hands it will also be helpful. Use a butter knife to run under each circle to separate them from the parchment paper. If you’re transferring them a far distance be sure to use a rimmed baking sheet. And if any fall apart in the transfer you’ll want to add the dough to your remaining dough to re-roll and cut again. 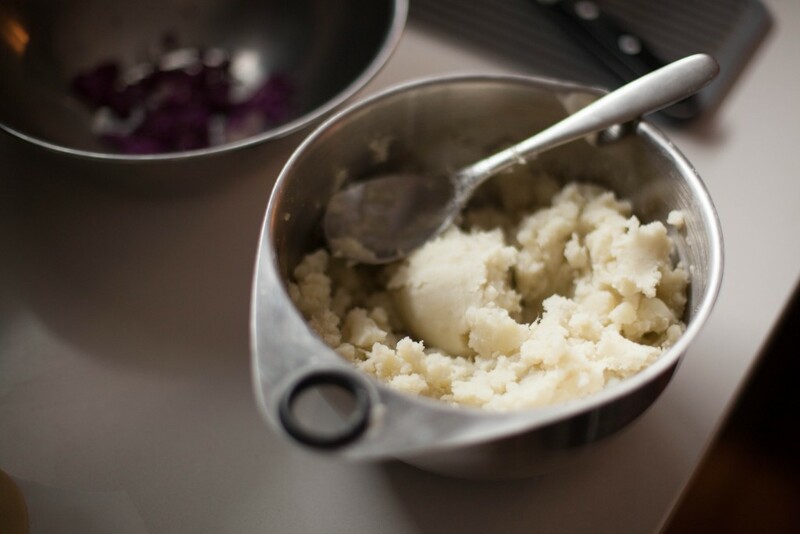 If you’re not including white potatoes in your version of paleo you can always go with sauerkraut or try mashed sweet potato or yam. If none of that sounds appetizing, you can use whatever your heart desires for a pierogi filling. Maybe you’re a fan of mushroom & onions. Maybe you have no reason to remove dairy from your diet and you’d enjoy some cheese and onion (typically cottage cheese is used). Maybe you’d prefer sautéed spinach. Maybe you enjoy pockets of meat. In that case pulled pork, beef, chicken or lamb are a few options for you. Or you can go with some seasoned ground meat as well. The possibilities are truly endless when it comes to filling your pierogi to your hearts content. Those are just a few savory options. 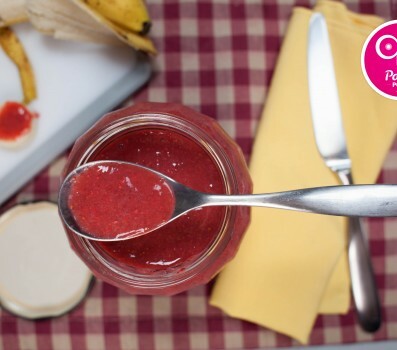 You can also make dessert pierogi with your choice of fresh, dried or fruit jam. My friend Magda’s favorite sweet filling is dried plums. This step, for me, was the hardest part! It really helped to have an extra set of hands, thanks to Jeff, for filling and closing the pierogi. You’ll want to have an egg wash waiting, which is just a whisked egg with a few drops of water added in. At this point it is important to already have your filling made so you can add a small amount of it to the center of each pierogi disk. Once you’ve run the rim with the egg wash it’s time to immediately seal them. 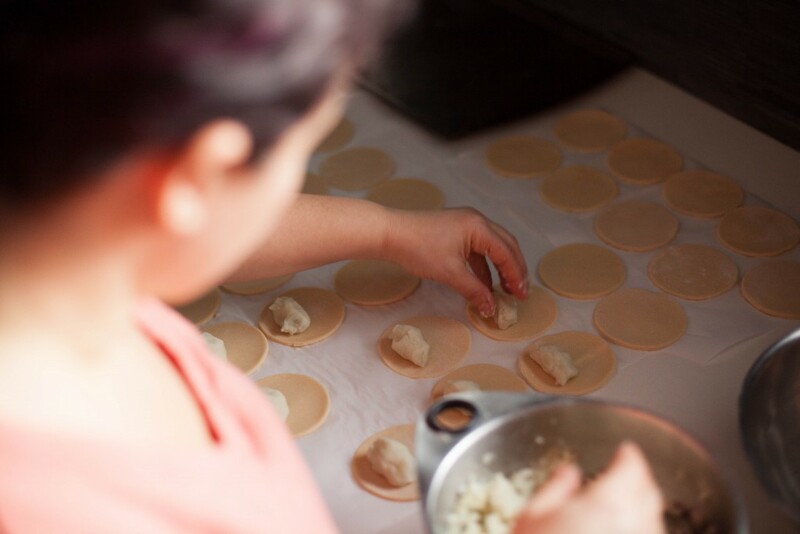 To seal each pierogi, gently press the edge closed after folding one end over the other to seal in the filling. 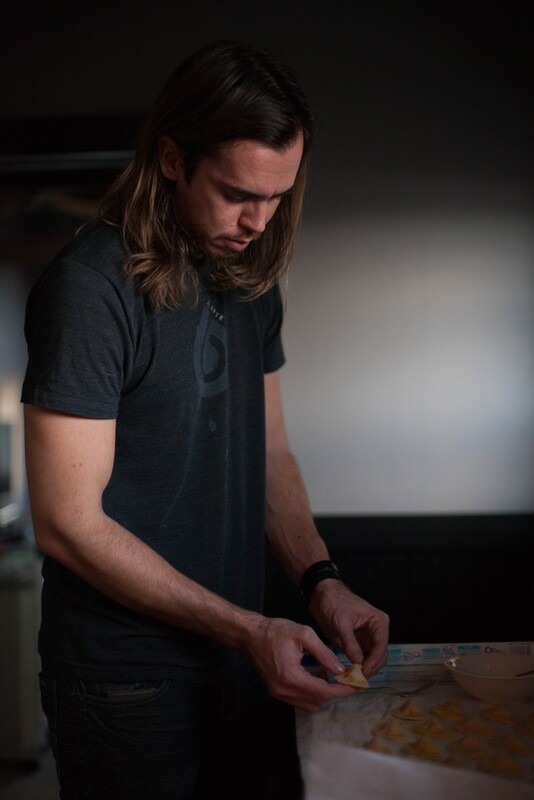 With your fingers you’ll want to press the edges closed. If that doesn’t work you can always use a fork though it will provide a different visual as compared to the traditional pierogi. Jeff was ten times better than I was at sealing the edges with his fingers and the ones sealed with a fork were definitely my doing. 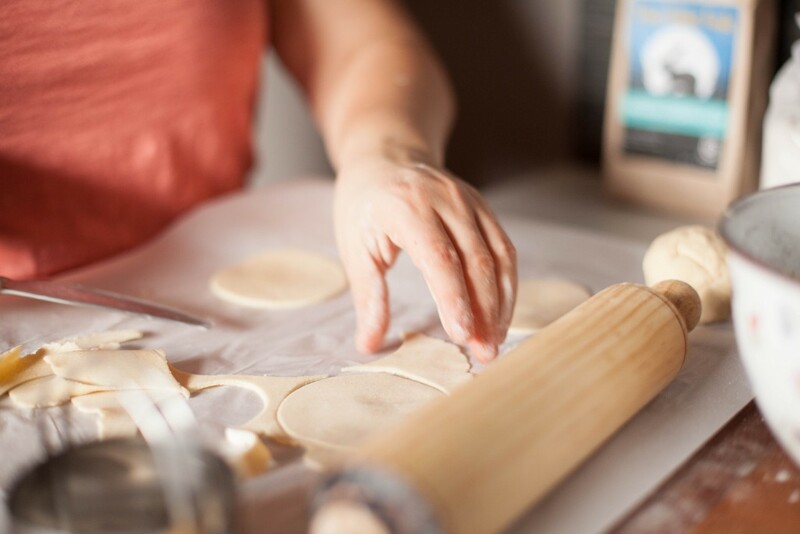 Once they’re sealed, you’ll want to run another swipe of egg wash around the edge and transfer the filled pierogi to a rimmed baking sheet to again sit until you’re done with all of them. 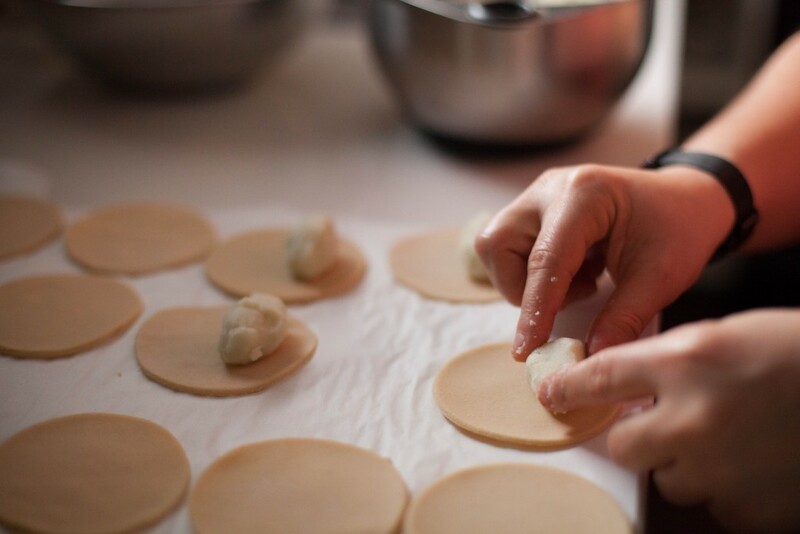 Once they’re all filled, you’ll want to cook the pierogi. To do that you’ll gently transfer a hand full of the little pockets into lightly salted boiling water. After they float to the surface, cook for an additional 2 minutes longer then remove from the water with a slotted spoon. Once done they are ready to serve. 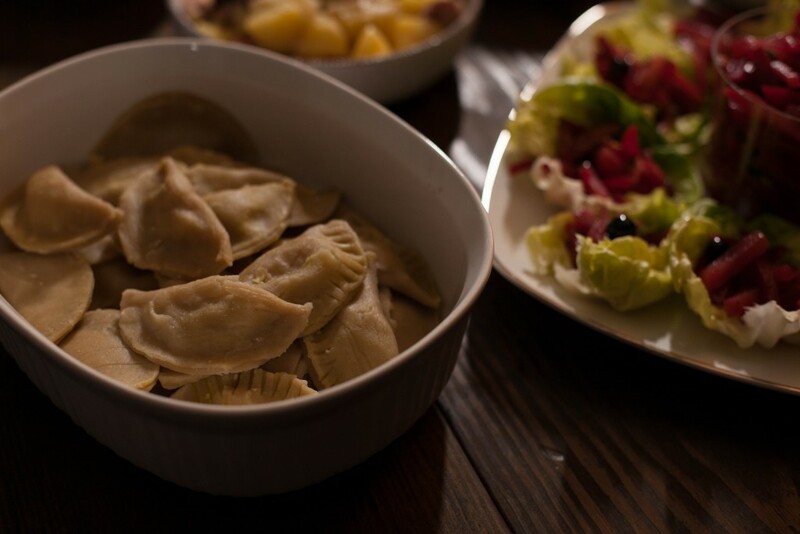 Traditional pierogi from Poland are typically served browned. 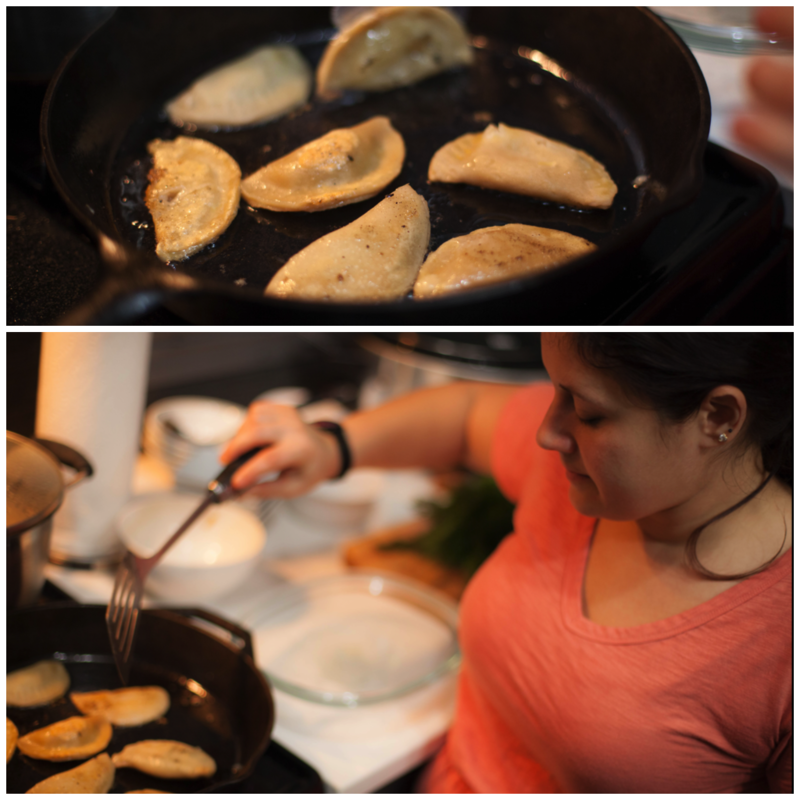 To do this final (optional) step, you can pan fry the boiled pierogi in butter or lard. Be sure to cook them in small batches so you don’t overcrowd the pot or pan. If you’re unfamiliar with lard, I highly recommend looking for a pasture-raised, local product direct from a farmer. And when that’s not possible, or even if it is, I highly recommend Fatworks for all your traditional cooking fat. In my research reading about pierogi I read about different ways they can be colored. If I wasn’t creating an entire spread of dishes for up to 15 people, I may have experimented a bit more. As a reference for myself, and also as a note for you, here are the recommendations I found for making your pierogi pretty. To make yellow pierogi add some turmeric during kneading to the dough. To make orange pierogi replace some water with a carrot juice. To make green pierogi replace some water with spinach juice. 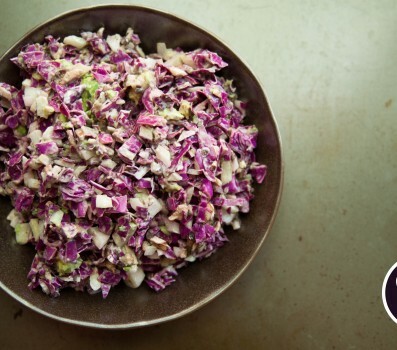 To make pink pierogi replace some water with red beetroot juice. 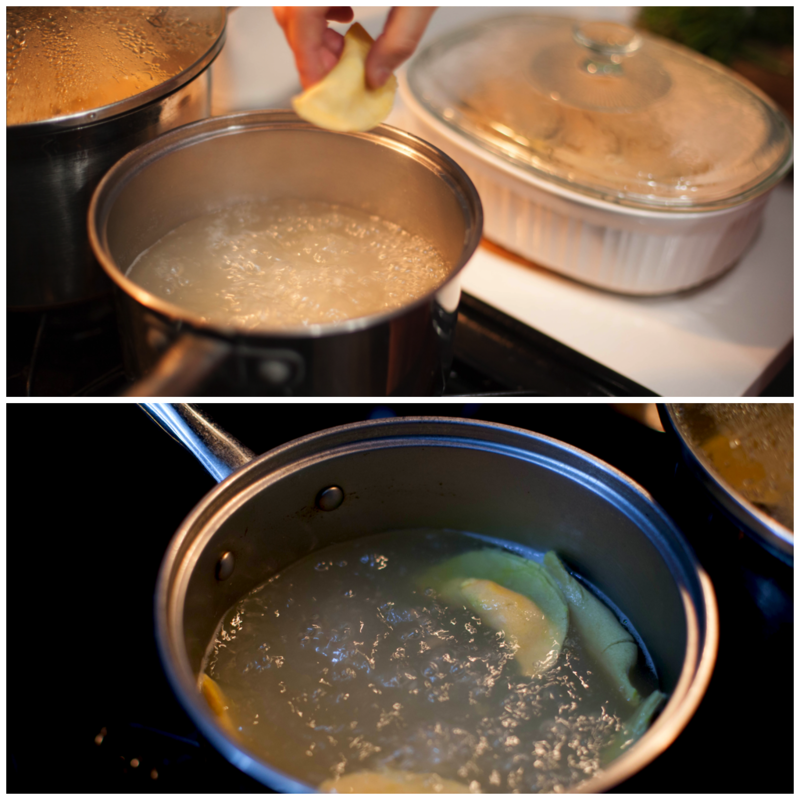 To Prepare the Filling: Add quartered potatoes to a medium-sized saucepan, cover with water and bring to a boil. Cover and simmer until potatoes are fork tender, approximately 30-40 minutes. Drain the potatoes and mash until smooth. Stir in a drizzle of olive oil and sea salt to taste. Cover and set aside to slightly cool. To Prepare the Dough: Crack 2 eggs into a medium-sized mixing bowl. Add water and 1/4 teaspoon sea salt. Whisk to combine well. Add half the flour and stir until it is fully incorporated. Then add the other half and continue to stir until well combined, if necessary add additional water. Using your hands for this will be best so you can feel the dough form a thick sticky dough. 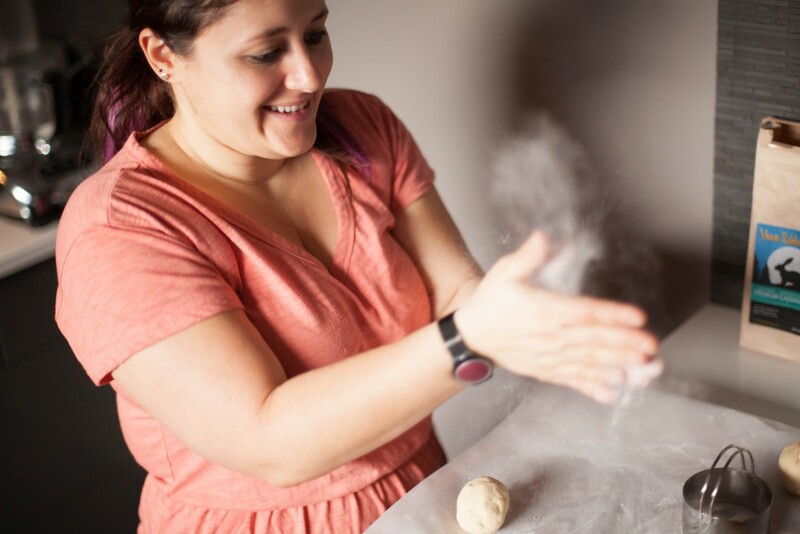 Use your hands to mold the dough into a ball. 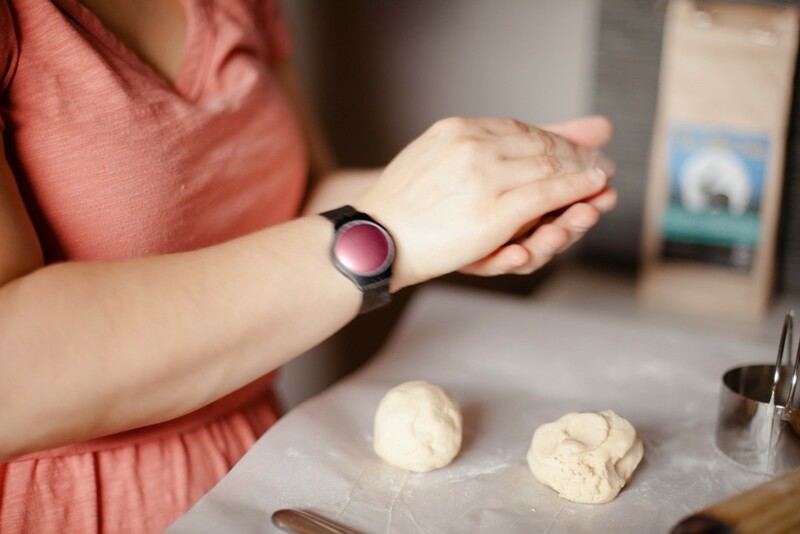 Separate the dough ball in half with your hands and form 2 dough balls. Divide each in half again so you have 4 dough balls. Prepare a floured surface: I placed a couple sheets of parchment paper over my cutting board and added a sprinkle of cassava flour on top. 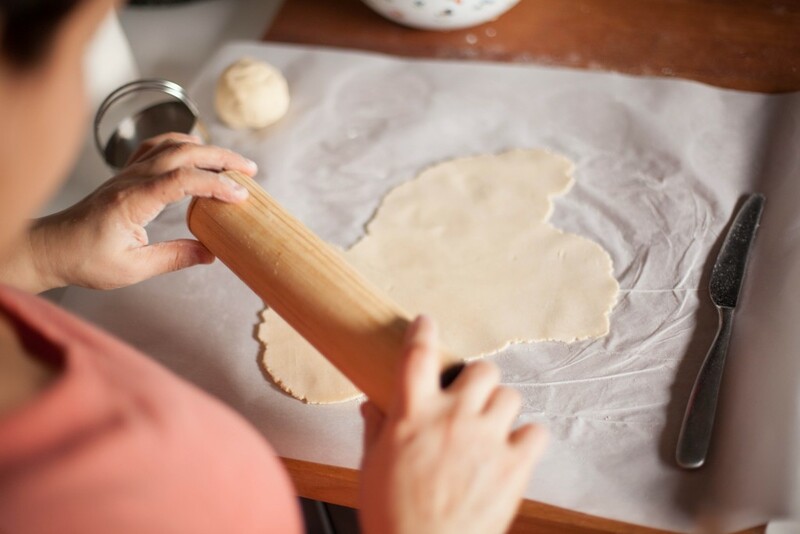 Using a rolling pin, roll each dough ball as thin as possible on the floured surface. It should be almost translucent, approximately 1/8-inch thick. 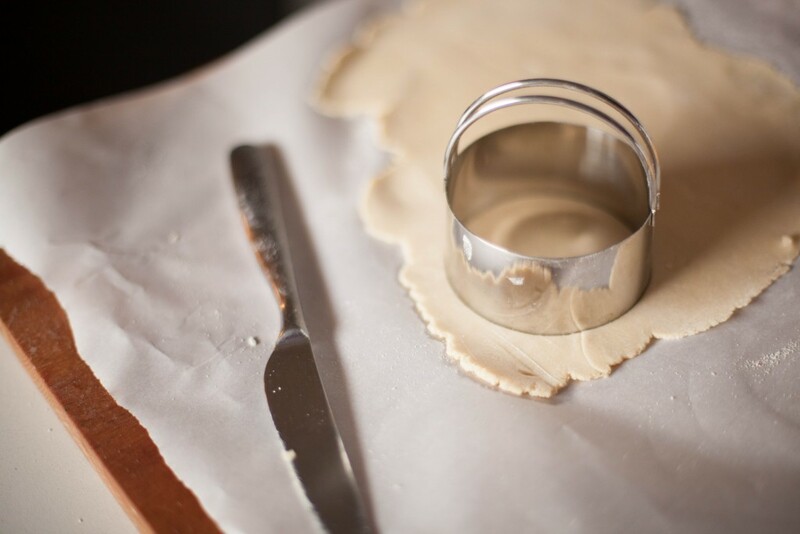 Using the rim of a glass or a 3-inch biscuit cutter, cut the dough into circles. Set aside each cut round on a new sheet of parchment paper on the counter. 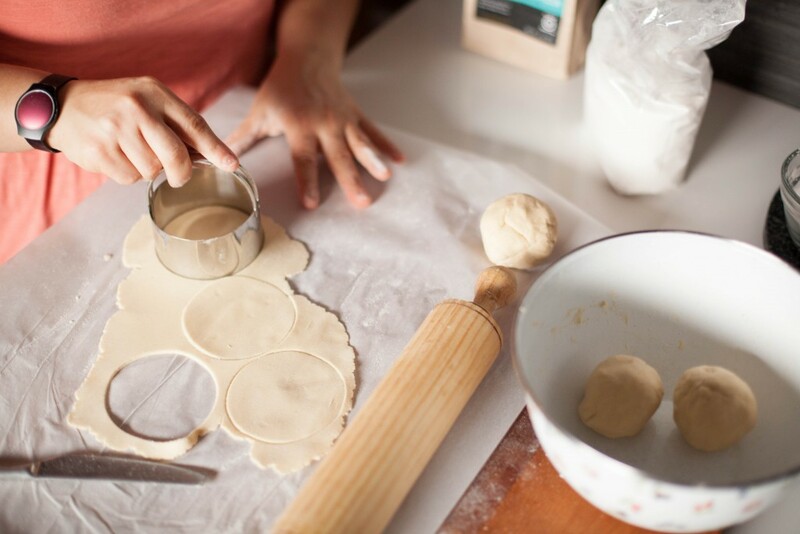 Add remaining dough pieces to the next dough ball and continue to roll and cut circles until all the dough is used. Place a small amount of mashed potato filling in the center of a dough round. Be sure to leave about a 1/4-inch edge around the entire circumference of the round. Do not use too much filling otherwise the pierogi won't fold in half properly and will bust open prior to or while boiling. In a small bowl, whisk the last egg and add a few drops of water, if necessary (if egg is too thick still after whisking, you'll want to add water to have a more liquid consistency). Use your fingers to brush the edges of each circle with the beaten egg. The egg acts as glue to hold your pierogi together. Fold the dough in half into a half-moon shape. Pinch the edges of the rounds firmly together using your fingers (or lightly with a fork). The pinched edges should appear as one piece of dough. By tightly sealing the edges this seals in the filling and allows them to stay together while cooking. Transfer the finished pierogi to a large dish and keep covered with plastic wrap to prevent the dough from drying out. Add water & several pinches of sea salt to a large stockpot over medium-high heat and bring to a boil. In batches, place the pierogi in the boiling water. When they float to the top of the water, boil for 10-12 minutes. Test one to see if the dough is cooked, it should be the texture of moderate to firmly cooked pasta. Remove the pierogi from the pot with a slotted spoon and transfer to a new serving dish with a lid. Continue until all the pierogi are cooked. 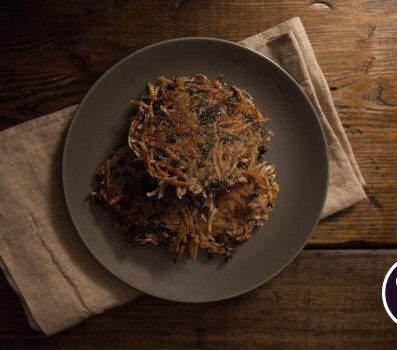 You can serve the boiled pierogi or take it one step further and fry them. In a large skillet over medium heat, melt 1 tablespoon of lard. Brown the boiled pierogi on each side until slightly golden or crisp. Keep an eye on them while you're frying. Serve warm.